THE PASSION OF THE CHRIST — about as much “passion” as the average Ron Jeremy flick. THE AVIATOR — more polished than Barbie Benton's bannister. DESPERADO — serves up a batch of disappointing carnage asada. DEADLIEST CATCH (TV) — brave men fighting seas more swollen than Renee Zellweger's face after a bee sting. See these and many more at Need to Vent! "You see my son, you make your heaven and hell for yourselves on earth, you only bring it with you here." 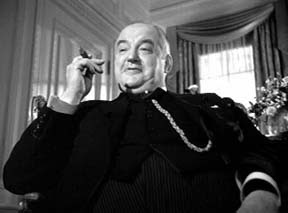 Those are the frightening words spoken by Reverend Tim Thompson (played by the great Sydney Greenstreet) to a small group of passengers aboard an eerie steamship shortly after its departure from war-torn London. The year is 1944, and it will soon be "Judgement Day" for a varied array of unique individuals who don't yet realize they died enroute to the docks when a Luftwaffe air raid bombed their shuttle bus from above. The opening shot indicates the passenger liner is owned by the Great White Steamship Company. 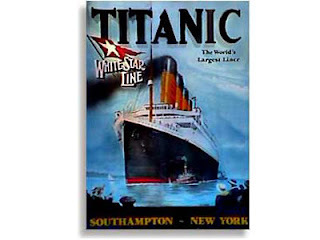 I suggest one stay clear of this cruise line just as you would the White Star Line, the only difference between the two is you will probably go to a cold, watery grave aboard the latter whereas you will be forced to disembark forever in either Bali or Belize (my idea of Heaven and Hell) with the former. The entire cast is truly terrific. John Garfield, Paul Henreid, Eleanor Parker, Edmund Gwen, George Tobias, George Coulouris, Faye Emerson, Dennis King, Isobel Elsom, Gilbert Emery and Sara Allgood comprise the entire passenger manifest. As Sara's name indicates, all are good (if not great) in their roles. Together, they comprise an excellent ensemble, although I will admit that Garfield tends to go over the top on occasion. Of course, in this morality play the only baggage each brings aboard the unnamed ship is the baggage they carry inside. It is the magnificent Greenstreet as Reverend Thompson, aka "The Examiner," who sends each to their ultimate destiny. You can expect a surprise or two along the way but be forewarned -- the unexpected, unprincipled denouement is perhaps the most exasperating in the history of American cinema. Yes, the Gospel according to Jack L. Warner simply had to have a happy ending even if it makes no sense whatsoever. For this unpardonable indiscretion I'm sure he is now permanently residing in an outlying area near Belize City. Also, pay attention to the music in BETWEEN TWO WORLDS. The appropriately melancholy and mysterious score was done by Erich Wolfgang Korngold -- often credited with "inventing" the syntax of orchestral film music. Clearly he remains one of the best ever at his craft, and should you be looking for a little controversy, I encourage you to get a copy of KING'S ROW (1942), starring Ann Sheridan, Robert Cummings and Ronald Reagan. Listen to the powerful score and then tell me John Williams wasn't at the very least "extremely influenced" when he wrote his score for STAR WARS. If George Harrison can be successfully sued for plagiarizing the Chiffons' "He's So Fine" for the melody of his own "My Sweet Lord," then Mr. Williams must have a hard time sleeping. I'm tempted to call the Law Offices of James Sokolove, but I refrain since an eerie, unnamed passenger ship belonging to the Great White Steamship Company awaits. Mr. Williams -- meet Mr. Warner. Welcome to NeedToVent! My name is Robert A. Nowotny and I was born in New Braunfels, Texas on July 4th, 1948. Although my life-long dream to become a dirigible pilot never materialized, I did earn my private pilot license and have owned several single-engine aircraft over the years. Among other things that you might find interesting is that my one and only at-bat in "The Friendly Confines" of Wrigley Field resulted in me grounding out to the second baseman while facing Hall-of-Fame pitcher Ferguson Jenkins. I have been kissed not once, not twice, but four times by the "The Spider Woman" herself, the fabulous Sonia Braga. And although my recent campaign efforts to be elected to the Texas State Legislature failed, I can declare with certainty that I wasn't your average, pasty-faced, old white guy running for office. But perhaps I am best known for producing five independently financed feature motion pictures and a number of documentaries, including one Emmy Award winner. And so when I am not flying or seeking kisses or political office or producing another film project, I spend my time "venting." Such is the fate of this reasonably intelligent human being in today's world.